Tags: Arsenal, Carlos Tévez, Chelsea, Emirates, Gerviniho, Liverpool, Manchester, Manchester City F.C., Manchester United, Nathaniel Clyne, Paul Scholes, Premier League, Stoke City F.C. After a two-week international break the premier league was back on Saturday bringing out a mixed bag of results.Norwich were left waiting for their first league win of the season; Manchester City ,Chelsea and Liverpool were held for away draws against Stoke,Queens Park Rangers and Sunderland .Arsenal thumped Southampton at home whereas Fulham maintained their perfect record at Craven Cottage. Robert Snodgrass of Norwich City battles with Mark Noble of West Ham during the Premier League match at Carrow Road. Newly promoted West home continued its strong start by adding a point on road against Norwich.The Canaries went on to secure their third straight draw of the season.They are yet to win a match after their lost in the season opener.Neither side impressed throughout the match apart from few close chances created in the second half of the match. 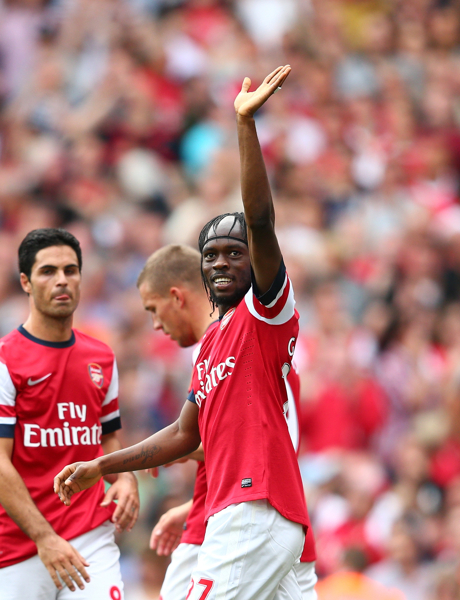 Gervinho scored a brace for Arsenal in a 6-1 win over Southampton at emirates on 15th September 2012. The Gunners continued their good form after the international break thumping newly promoted Southampton at Emirates.Southampton from the start were cautious and sitting behind allowing Arsenal to move more strike force forward.Lukas Podolski score the opening goal in the 11th minute when his cross shot was saved by Kelvin Davis but rebounded in off Hooiveld.Soon afterit was the German again who gave Gunners a two goal cushion from a free kick goal in the 31st minute.Gervinho added his first in the 35th and a second own goal through Nathaniel Clyne in the 37th left little doubt about the result before half.Daniel Fox scored the lone goal for the visitors .Southampton have now lost all the matches of the season whereas Arsenal remained undefeated with two wins and two draws. West Bromwich Albion’s unbeaten start to the new Premier League season came to a clobbering halt as Fulham scored thrice to remain unbeaten at Craven Cottage.Dimitar Berbatov on his home debut after his transfer from Old Trafford netted twice to provide an easy win for Cottagers. It took a superb performance from Ben Foster in-goal to keep the score to 3-0 as the hosts menaced to run rampant in the second half.Third goal for Fulham came from Steve Sidwell in the 89th minute. 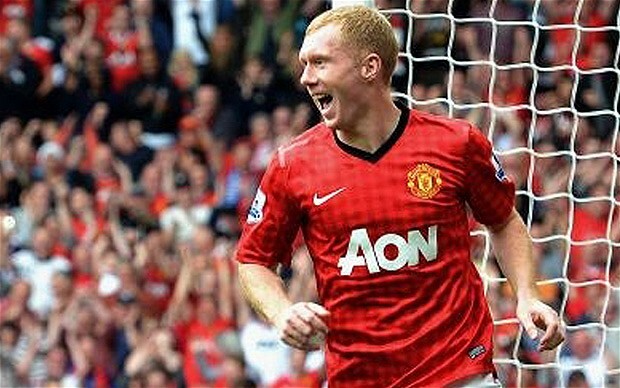 Paul Scholes celebrating after scoring in his 700th appearance for Manchester united at Old Trafford on Saturday. Manchester united climbed the league table within one point of the Blues atop the table by thrashing Wigan 4-0 at Old Trafford.First half was scoreless along with a lackluster performance by the Red Devils.They came all guns blazing in the second half when Scholes sparked United by hammering home a rebound six minutes after halftime for his 155th goal for the club in his 700th match.Hernandez made up for the missed penalty kick in the 63rd minute by flicking past the Wigan keeper.Rest two goals came from the newbies Buttner in 66th minute and Powell in 83rd minute.After suffering a shock season opener loss to Everton,Red Devils are back with their Midas touch firing from all fronts. Anton Ferdinand of QPR and John Terry of Chelsea involved in pre match handshake controversy on Saturday at Loftus Road. A game overshadowed by the pre-match handshake between Anton Ferdinand and John Terry ended in a stalemate with no team managed to score a goal.The Blues had a couple of very decent penalty shouts, none given whereas wonder kid and Man of the match for the fourth consecutive match blew up an easy chance.Chelsea will be focusing on their mid-week champions league match against Juventus . Javi Garcia scored on his Manchester City debut against Stoke city on Saturday. Manchester City once again failed to get the perfect start this season as they were held to a one all draw against Stoke city at Britannia Stadium.It was Stoke City’s fourth straight draw this season.Peter Crouch gave the hosts an early lead in the 15th minute despite a suspicion of handball.City came back to score in the 35th minute from a free kick by Carlos Tevez curled in to Garcia, who turned a header from the edge of the six-yard box to the left post for his first goal in the Premiership.Both team stretched hard in second half creating chances with city almost getting a late winner from Nasri only to be denied by Stoke goalkeeper Asmir Begovic.Stoke introduced Michael Owen in the closing minutes hoping to score a dramatic winner. 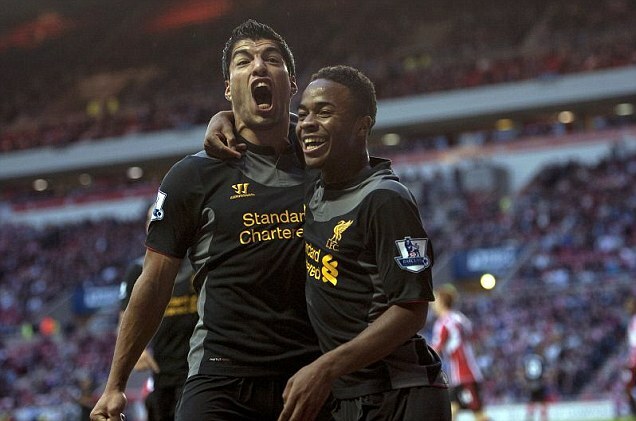 Suarez celebrates with Raheem Sterling after scoring the equalizer against Sunderland on Saturday at Stadium of Lights. Liverpool was able to avoid its third loss with a 1-1 tie against Sunderland on Saturday at the Stadium of Light during an emotional week for Liverpool following the Hillsborough revelations.Steven Fletcher scored his third goal of the season in the 28th minute to give the hosts the lead.Luis Suarez managed to get the equalizer 19 minutes from time to give the Reds their second point.Liverpool is still without a win after four matches. West ham crushed Fulham 3-0,Swansea/Tottenham /Wigan managed a lazy draw against the visitors Sunderland/Norwich/Stoke City.Manchester City managed three easy points against Queens Park Rangers at Etihad. 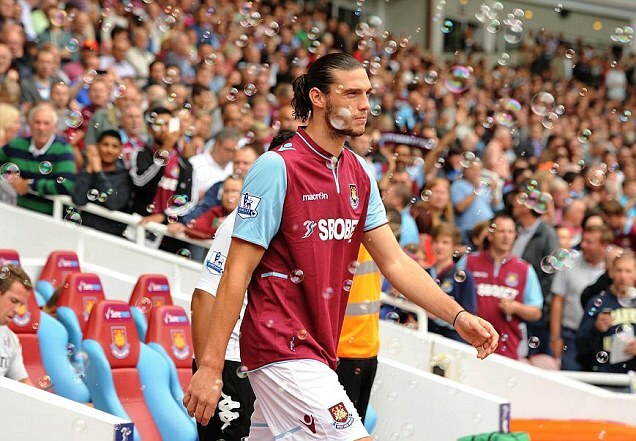 Andy Carroll making debut for West ham against Fulham on Saturday. Liverpool striker on loan Andy Carroll made an impressive debut for West ham as he set up two goals in a cruising victory against woeful Fulham.Carroll started with a header which let Ricardo to tee up Kevin Nolan to score the first in 53 seconds,the fastest of the season.Later Winston Reid powered in a free header from a corner to make it 2-0. Matthew Taylor put hammers 3-0 up in 41st minute .The Cottagers made attempts to break the deadlock as Jaaskelainen made eight saves in the match. 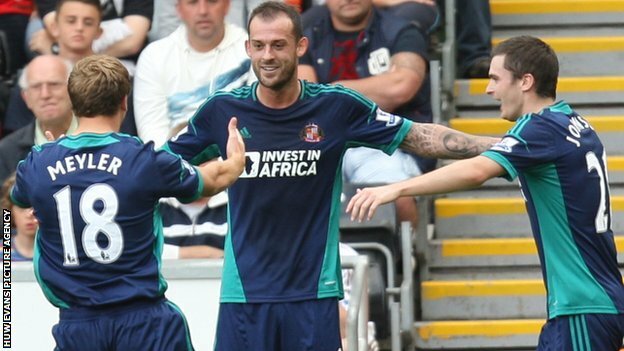 Steven Fletcher scored a brace on debut for Sunderland against Swansea. Swansea’s 100 % start to the season came to a halt as Steven Fletcher’s first goals for Sunderland managed a 2-2 draw at Liberty Stadium.The visitors were denied victory just because of the midfielder Michu who scored his fourth goal in just three matches.Before this hosts got one back with a superfine finish by Routledge in 45th minute.This dramatic draw was marred by a serious ankle injury to Neil Taylor. Moussa Dembele on debut scoring for Spurs against Norwich . With just two points from three matches ,this is not the start Spurs supporters were hoping for.Spurs started the scoring with the man on debut Moussa Dembele scored a pretty goal in 68th minute . But the Lilywhites and their manager Andre Villas-Boas will have to wait for their first win this season after Robert Snodgrass equalised late in the 85th minute for Norwich. Gareth McAuley celebrating after scoring second goal against Everton at Hawthorns. West Brom continued their good run in the league with an impressive 2-0 win over Everton at The Hawthorns.This was their third result after a home win over Liverpool on opening day and then drawing with Tottenham on the road. 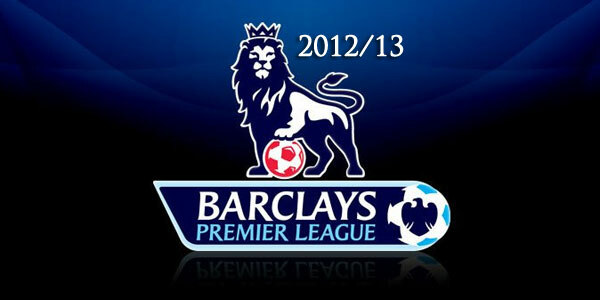 Shane Long scored the first goal of the match in 63rd minute.Second goal came from Brunt’s corner in the 82nd minute who found the head of defender Gareth McAuley who sent the ball into the back of the net.The Baggies are still undefeated in EPL play with two wins whereas Everton dropped to fourth place with six points. Carlos Tevez demolished QPR on saturday at Etihad. Unlike their first two matches Manchester City took lead for the first time this season with City dominating the proceedings early on and with QPR having no response for the English Champions.City took lead in 16th minute when Toure smashed the ball into the back of the net.In the 59th minute, QPR managed to level things up in the game with an easy header into the goal from Zamora.After that City got back on the offensive and scored a goal in the 61st minute of the game when a ball crossed by Tevez was brilliantly headed into the goal by Dzeko to get back the lead.Last goal of the match came from none other than Tevez who managed to deflect Dzeko’s effort into the back of the net and past the keeper. Arsenal played a goal less draw against Stoke City whereas Liverpool were unlucky not to walk away with three points against Manchester city at Anfield on sunday,August 26, 2012. Disappointed Arsenal players after draw against Stoke City. Arsenal haven’t scored neither conceded a league goal this season.On Sunday it was a second draw for both the clubs this season. Arsenal failed to take their chances once again as Cazorla, Giroud and Podolski all missed glorious chances to open goal account for the Gunners.Throughout the match Arsenal looked a stronger side penetrating the Stoke defense but failing to convert.Stoke had a goal and a penalty rightly denied by the referee as Peter Crouch headed one to Jermaine Pennant who put it in the back of the net.For Stoke city it was a positive result to manage a draw against last years top four side whereas Arsenal needs to win if they have to remain in hunt of title run. Carlos Tevez celebrating after scoring the equalizer against Liverpool at Anfield. Manchester City is having a rusty and lackluster start to the season as for the second week in a row they had to work really hard to earn a points against Liverpool at Anfield.The Reds were the stronger side for most of the match and only for their defensive lapses had to concede a draw.Merseyside took a 1-0 lead with a brilliant header from defender Skrtel in the 34th minute.For rest of the half Liverpool had a very strong first half, dominating possession.Equalizer came in the 63rd minute when Yaya Toure scored from close range.Luis Suarez got the lead back with a superb curling free kick around the wall and past goalkeeper Joe Hart.An unforced error allowed City to level the match in 80th minute when Carlos Tevez easily intercepted a back pass from Skrtel and dribbled around goalkeeper Pepe Reina and scored.